Chef Paul Bocuse Truffle Soup Recipe is a delight to experience. 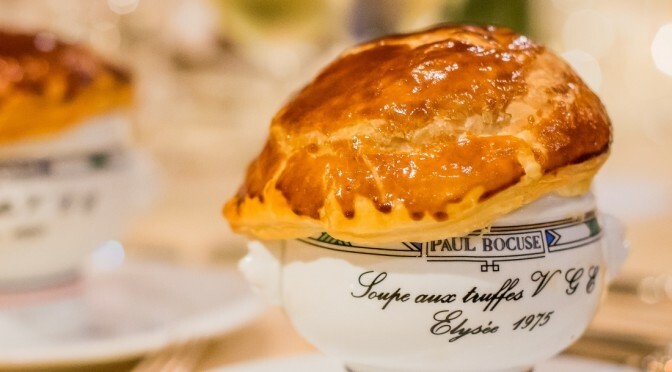 It is one of Paul Bocuse’s famous dishes which serves in Restaurant Paul Bocuse. This “Paul Bocuse Soupe Aux Truffes” contains mushroom and stock chicken which gives the perfect touch to French Truffle Soup. I would really like an innovation in my traditional cuisine an who better than the Famous Chef Paul Bocuse. The French oldie is capable enough to give the right twist to all traditional dishes. Here’s another fancy I’d love to make a flaunt the name in my group. Chef Paul Bocuse Truffle Soup Recipe is a delight I recently experienced the right savior for my supper hunger. Yet it is a delight that surprises my taste buds every time I have the Black Truffle Soup. Bring stock to a boil in a saucepan. Lightly salt chicken breast and place in stock. Leave (sic) it simmer for six minutes, then drain. Put the stock for the soup aside. Peel the celeriac and the carrot. Cut the celeriac en Matignon (first into ½-inch [12-mm] slices, then into dice). In the same way, cut the carrot en Matignon (first into ½-inch [12-mm] slices, then into dice). Cut the mushroom heads into thick slices, then into strips, and then dice. Mix them with celeriac and carrot. Cut the truffles into ver file slices. Allow 1 ounce (30 g) of preserved truffles per person, instead of a ¾ ounce (20 g) of fresh truffles. Pour 1 tablespoon of Noilly Prat into each of four ovenproof porcelain bowls that hold 1 to 1¼ cups (250 to 300 ml). Add 1 rounded tablespoon of the vegetable en Matignon, divide among the bowls. Cut the chicken breast into ½-inch (12-mm) slices, then dice. Divide it among the bowls. In the same way, add the slices of truffle. Cover with the stock, foie gras stopping ¾-inch (2-cm) below the brim. Roll out the flaky pastry on the work surface. Cut out four circles, 5 to 5½ inches (12 to 14 cm) in diameter. *Place a pastry circle on each bowl. Turn the edge down over the brim, pressing lightly to seal it. Mix the egg yolk with a teaspoon of water and a pinch of salt. Brush it over the pastry. Place in the oven, and cook for 20 minutes. Cut the edge of the pastry with the point of a knife. Serve at once. Tip: To cut the pastry circles to the right size, measure the diameter of your bowls and add at least 1¼-inches (3 cm). Then place something round of that size (a bowl, a saucer, a metal disk) over the pastry and cut around it. Well, serve the hot soup for an amazing experience. And what do I do with the foie gras??? Please see the updated recipe, thank you!